AIM is an excellent messaging client to keep in touch with your friends/loved ones in real time. You can share images, send messages and enjoy voice chat with your friends globally. AIM gives you a chance to access a host of social media networks, including Facebook, YouTube and Twitter. Apart from social integration, the instant messaging app for windows comes with modern features like drag and drop file sharing, blocking of unnecessary contacts and allowing users to set their online status. The program comes with plugins that lets users add some new features to their buddy list. You can easily add as many plugins as you like, with a single click at the bottom of buddy list. You can also customize the shade of your buddy list window. The messaging application also allows you to enter your Facebook credentials if you don’t want to create a separate account for AIM. The utility runs on various platforms like Windows, Mac, Android and iOS. The instant messaging and VoIP service allows users to chat using emoticons which livens up the chat conversation. Download AIM messenger to conveniently exchange messages among you near or dear ones across the globe. The chat application allows you to retrieve messages you missed while you were offline. It also lets you play games online with your AIM friends. > Group conversations – Allows you to start group conversation by browsing “Group Chats” option. > AIM Express – You can send messages directly from web browsers like Internet Explorer or Navigator. To use this feature, one must have AIM’s registered account. > AIM Remote – By adding this option to your personal webpage, one can easily contact you by sending an instant message or email. > Social notifications – Get notifications from your social networks and chat with buddies on AIM and Google Talk. > Video chat – The messaging software for PC allows you to commence online video chat with your friends. To use the feature, you should have a video camera on your system. > Import contacts from Facebook, Twitter, etc. 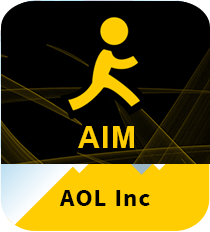 AOL Instant Messenger (AIM) is an outstanding choice to send messages to your friends or business peers around the world. You can save your online conversation or delete messages to ensure privacy. Wow it's Life-stream allow users to access a host of social networks, including Facebook and Twitter.